"Winning Best Device-Development is a welcome acknowledgement from the industry of Pelikon's standing in the advancement of Printed Electronics. Closer to home, it was recognition of the ongoing hardwork the Pelikon team is undertaking to achieve world class development." "The printed electronics award for Best Commercialization from IDTechEx gave Menippos GmbH great international and national publicity and enforced the trust of venture capital companies and target customers in our product and technology." IDTechEx Printed Electronics Awards recognize company innovation, success and development. 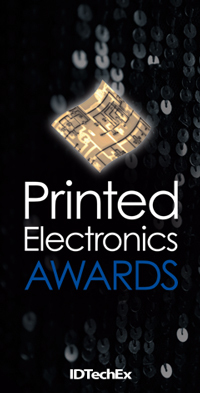 The award ceremony will be held at the industry's largest gathering – Printed Electronics USA in San Francisco, November 13-14, bringing together companies from around the world. The Awards are hosted by IDTechEx, a leader in providing independent global research and analysis on the development and application of printed and potentially printed electronics (organic, inorganic, composite). IDTechEx publishes the free news portal Printed Electronics World. If you would like your company to be recognized for outstanding achievements in the following categories simply follow the entry instructions. Any company operating within the printed or partially printed, organic or thin film electronics market is welcome to apply. This award will be given to the most significant technical development over the last 24 months (August 2005- August 2007) in the field of material development. This award will be given to the most significant development of a manufacturing device, process or production plant in the industry over the last 24 months (August 2005- August 2007). This award will be given to the most significant development of a device or component in the industry over the last 24 months (August 2005- August 2007). Devices include a logic circuit (e.g. RFID tag), display, photovoltaic cell, battery and sensors. These will be a demonstrated circuit in a lab/prototype environment. This award will be given to a company who has launched a new product based on printed electronics and is in the process of bringing it to market. The category will be assessed on the technical development of the product, its potential market, and benefits it brings over alternatives. This is the award given to an actual commercial success with an end product using printed electronics. Judges will look for success in terms of products sold and revenues generated. The panel is made up of independent experts. Submissions should not contain confidential data. Companies that apply will not be named. In each award category three finalists will be selected and named. Of the three finalists, one will be presented with the award at the dinner. To apply please download the submission form here (NOW CLOSED) . America's largest event on printed and thin film electronics. With over 50 exhibitors and more than 500 delegates anticipated - the whole industry will be at this event. Will you?